In 1972, my two-year-old sister could sing all the words to this Rick Nelson hit. Why she latched on to this particular song when it came on the car radio none of us will ever know – not even Julia. She would sit in her car seat – not one of the safety-conscious car seats of today – and practically dance in her seat, legs and arms bopping to the beat. So “Garden Party ” has a special place in my memories. But there’s an interesting story to the song itself as well. Rick Nelson was, of course, one of two sons of Ozzie and Harriet Nelson, famous stars of their own 1950s and 1960s television show, The Adventures of Ozzie and Harriet . To be an Ozzie or a Harriet, to be a Ricky or a David, to be a Nelson meant that you were part of a wholesome, all-American family. The Nelsons epitomized the white picket fence dream of Eisenhower’s America. As a teen in the late 1950s, Ricky Nelson emerged as a rock-and-roll performer, with an emphasis on rockabilly. In short order, he became a teen idol. Though he officially changed his performance name to Rick Nelson in 1961 when he was 21, he would forever be known as “Ricky” by the many teen girls who had fallen in love with him. With the onset of Beatlemania, Rick Nelson’s music fell out of popularity. By the late 1960s and early 1970s, he was still making music, recording in the country-rock genre emerging at the time. But his new music was not catching on in quite the way he hoped. Things came to a head in 1971 when he performed at an oldies concert at Madison Square Garden. Other oldies artists – including Chuck Berry, Bo Diddley, and Little Richard – played the show, which was intended to showcase the music of a bygone era. Wearing bell bottoms and a purple velvet shirt and sporting long hair, Nelson at first played “Be-Bop Baby,” “Hello, Mary Lou,” and other old hits, but when he launched into a country version of the Rolling Stones’ “Honky Tonk Women,” the audience booed him off the stage. Disgusted by what had happened at the show, he wrote “Garden Party,” weaving together references to musicians and songs performed at the concert. In an essay for Chicken Soup for the Soul: The Story Behind the Song , his son Gunnar Nelson recalls: “After a lifetime of pretending to be a character he wasn’t – wearing the sweater on Monday on the set of Ozzie and Harriet after being a real rock star on the weekends – he was writing and performing for his own pleasure and satisfaction.” Gunnar says one of his most prized possessions is his father’s handwritten lyrics to “Garden Party,” featured at SongFacts, which includes extensive background on the song and on Rick Nelson’s career. 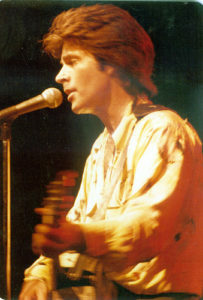 Nelson offers reminisces about the song in a 1983 interview. I love that “Garden Party” tells a real story – and I also love that it allowed Rick Nelson to get the last laugh. Ironically, he is really known now mostly for this song – a tune about not having his music appreciated. Though he never regained his earlier popularity by the time he died in a plane crash in 1985 at age 45, it seems Rick Nelson had learned the real lesson from that experience at Madison Square Garden – to be true to yourself and to your creative vision. Watch:Watch Rick Nelson play “Garden Party” on Midnight Special, hosted by Wolfman Jack. Now! Listen to StoryWeb on Spotify! Image Credit: Rick Nelson plays a concert in Lawton, Oklahoma. Used with permission, https://commons.wikimedia.org/wiki/File:Ricky_Nelson_free.jpg. Appreciate these images of your little sister as a two year old. Remember when I heard the news of Ricky Nelson’s death.